Fred Snowden was not only the University of Arizona head basketball coach from 1972-82, he was one of the most significant sports figures in American. Known as “The Fox,” Snowden was the first African-American to be a head coach in NCAA Division 1 basketball. 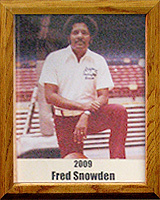 Snowden came to Tucson after being a high school basketball and baseball coach in Detroit and later assistant basketball coach at the University of Michigan. At Arizona, Coach Snowden and his “Kiddie Korps” enjoyed immediate success by having winning records in his first seven seasons and leading the Wildcats to the post-season three times, including the Elite Eight in 1976 and a Western Athletic Conference championship. His coaching record was 167-108 and he helped five UA players reach the NBA. Coach Snowden was inducted into the Arizona Sports Hall of Fame in 1988. He was named Tucson Man of the Year in 1973 and was named Coach of the Decade by the Arizona Daily Star in 1979. He passed away in 1994 at the age of 57.